From Rockdale, ran the road up to Winfield and then over to the west side of Huron before heading to its summit. Climb was pretty standard, but the real fun came on the descent. Usually the drop down to Clohesy Lake (east side of the peak) is a fairly nasty scree/cobbles/talus/boulder chute, but today it was still all snow and was in perfect condition for a long, steep, run-out glissade that dropped over 1000' of vert. Awesome. Found the goat path down to the lake and ran the 4wd road back down to Rockdale to complete the loop. 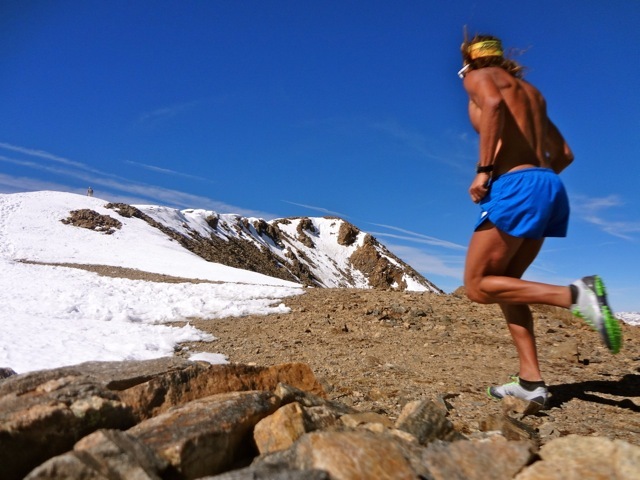 Proper mountain run. Legs were a little tired from yesterday's long outing, but not bad at all. Up and down Grouse Canyon. 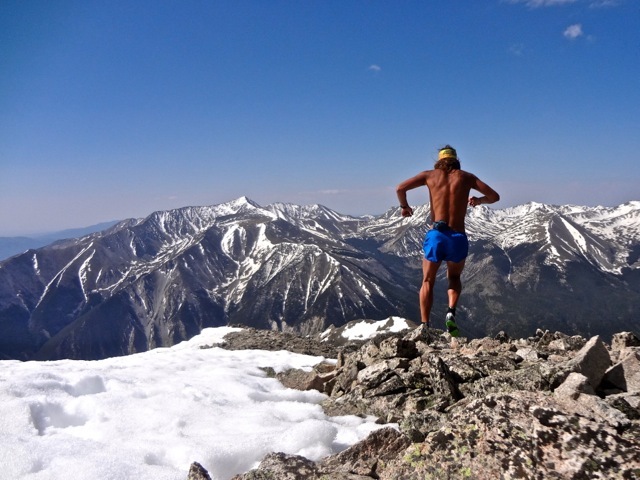 This is quickly becoming one of my favorite runs in the Sawatch. Proper goat path up the canyon, perfect footing for the march to the ridge at 13k' and then an engaging scramble/talus hop to the summit. Doesn't get much better. Seemed to be a bunch of smoke/haze in the air today, though. Legs had a bunch of energy despite waking up feeling groggy. Parked at the S. Cottonwood TH on the CT (8900'--this is the low point of the entire Nolan's route) and took the CT 4.5mi over to Maxwell Gulch to head up the mountain. Came back the same way. Definitely an out-of-character run for me since it started with 46min of flattish running (only 1000' of elevation gain total, more with the rollers), but once you get over to Maxwell Gulch things get interesting. Had no trouble finding the old trail on the northern side of the basin and took that up to ~10,500' where I broke left to bushwhack through the aspens in the avalanche gulley. After only about 4min of 'swhacking, though, I was on fairly open tundra/talus and marching uphill unimpeded to Princeton's NE ridge. From there it's just an extended talus scramble to the summit. CT to the summit was 1h16 (for 4300' vert), so it's actually a very comparable climb to any other 14er in the Sawatch, but just starts with the 1hr+/7mi contour on the CT from Yale's Avalanche Gulch TH. Definitely the longest sustained running on the whole route. Took 40min to descend from the summit back to the CT; feeling really good about doing this route in the dark now, think I have it dialed. Up and down NE Ridge/North Face from N. Cottonwood Creek TH. After what felt like a fiasco last Sunday afternoon, I knew I had to get back here to find the best line up this side of the mountain. Took exactly 15min to jog from the TH to where a bridge crosses back over to the north side of Cottonwood Creek. An avalanche gulley empties directly onto the trail right here, but I felt like I wanted to be in the next gulley to the west. Traversing/'swhacking over to that gulley through the forest proved to be surprisingly easy and within 10min I even found a (very steep) elk path heading up the left margin of the avy gulley. I crossed over to the righthand side when things looked good and then it was just a simple march up very good tundra and talus (and past airplane wreckage) to the ridge saddle at ~12,600' or so. Took 42min to get from the bridge to the ridge. From there I contoured below the ridge (and Pt 13105 that I'd actually summited on Sunday) on the left into the basin below Yale's north face and ascended directly up the center of this face to the summit. The last couple hundred feet of vert was kicking steps in steep snow, but it'd only taken 1h12 to get from the creek to the summit, so I was feeling really good about my newly scouted line. 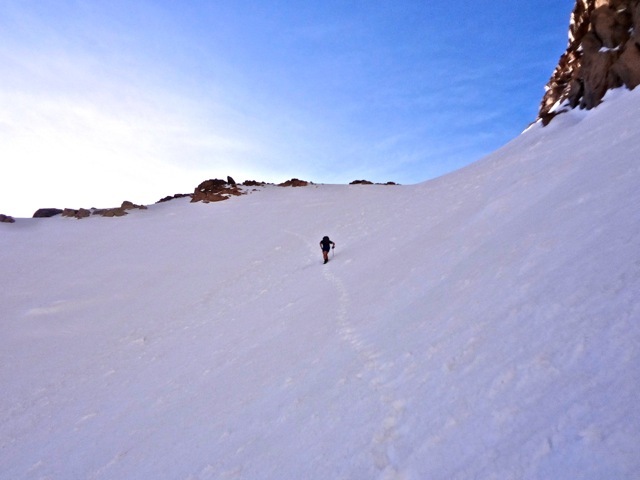 The descent was even more fun, glissading directly off the summit and contouring over to drop into the very steep avy gulley that deposited me right back at the bridge/trail 33min after leaving the summit. Really glad I went back to take another look at this side of the mountain. 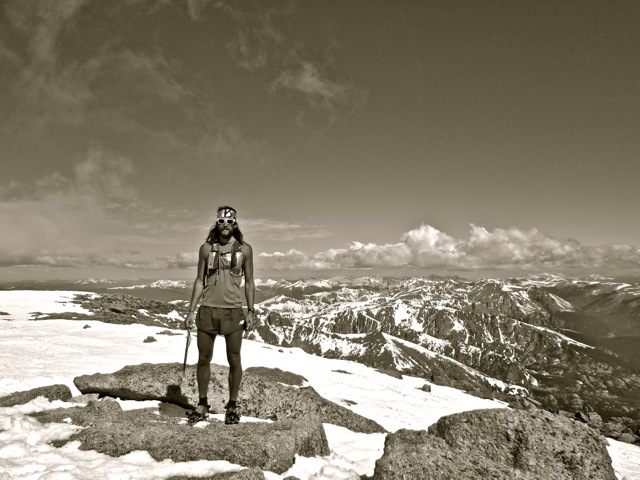 PM: 0:58, 3000' ~ First Flatiron+Green Mt. From Chat; really good run. A PR for ascending Green via scrambling the First (39:35 at Green summit; 10:55 to base of First, 11:15 scramble, 2:05 downclimb), and then I think maybe a PR for descending Greenman-SR-Amphi in dry (non-snow) conditions (15:55 from summit to Baseline trail junction) before realizing that I had a shot at breaking an hour for the Chat-to-Chat roundtrip, so I picked it up on the run back across the meadow for a 58:54. Funny thing was I didn't even start picking it up on the descent until about half-way down Greenman (wasn't planning on going all-out on the descent), but maybe sometimes you just need to wait for the flow to come to you. Was feeling a little extra motivation in the first place because I was trying to squeeze the run in before an appointment, thus no pause on the summit. Up Kieners, down Cables. 1:55 to the summit, which was only a couple minutes slower than when I went up the Cables last week. It always surprises me how quick a route Kieners can be in the right conditions. I was feeling great on the run up to Chasm Lake despite carrying crampons and an axe on my back. The scramble up Glacier Rib (left of Lambs Slide) was a little bit more methodical than usual because there were patches of snow to dodge, but when I got the axe out to cross Lambs Slide the snow was surprisingly kickable, even in the shade. The first crux on Broadway was still snow, so I was careful on this small downclimb/traverse, and then there was a little more snow to cross at the top of the Yellow Bowl/Alexanders. From there, it was essentially dry to the base of Kieners. The chimneys were all wet but there was only snow/ice at the top of the Bombay Chimney. On the 4th Class section up to the Staircase I stayed a lot farther right (toward the edge) than usual so as to skip the snow, but soon enough I was on the summit. The North Face proved to be, by far, the crux of the outing. I stubbornly didn't put on my crampons on the summit, so I lost a lot of time pussyfooting down the kicked steps in the snow above the Cables dihedral. When I got there it became very obvious that I wasn't going to downclimb the upper part without some metal on my feet, so I finally stopped and put on my crampons and then carefully downclimbed over the snow/ice/rock. If I'd had a rope I probably would've just rappelled the upper part and never messed with the crampons.The snow below the Cables was in terrible condition--crusty, and punching through to my knee with basically every step, super frustrating. Finally made it down to dry rock for the always enjoyable cruise back down to the trailhead. Up and down the Cables for 2013 ascent #15. Woke up groggy and unmotivated---almost decided to just head up to Chautauqua to scramble some flatties---but that would have meant running right away, whereas running Longs would give me a 45min drive to wake up, drink some coffee, and feel like a human. By time I got to the trailhead, of course, I was in olympic form, ready to take on the day. Back at the hut, not feeling very brave, I had packed my vest with a 6mm rap cord and a harness (along with crampons, axe, and gloves), planning to rappel the top half of the Cables on the descent but in the parking lot, brimming with confidence, I thought better of that and took them out. Ah, the games we play. Legs were surprisingly poppy heading up the hill for the second day in a row, and by time I got to treeline I was undecided as to whether I would head back up Kieners or take the Cables. Eventually, I decided to just do the Cables. It's funny; in my head, in the current conditions, I feel like the Cables are actually technically a little more difficult than anything I encountered on Kieners yesterday, but the amount of time that one is in a precarious position (just a couple of minutes on the Cables) is SO MUCH less than on Kieners (things are at least moderately technical for almost an hour). The climb up the Cables went really well, but I'm ready for that chunk of alpine ice on the top half of the dihedral to fall/melt out already. The descent of the north face--while soft in the hot sun--went way better than yesterday wearing crampons this time, and the downclimb was, of course, no problem. Happy I didn't bring the rope. And then it was just the usual run back down to the trailhead. Quick and efficient. Started from the Avalanche Gulch TH on the Colorado Trail at the base of Yale, with Joe. Finished at the Blank Cabin TH on the east slopes of Shavano where Joe's wife, Deanne, graciously picked us up. Joe and I did some actual running today---1:04 to go the ~7mi on the Colorado Trail from the Avy Gulch TH to Maxwell Gulch on Princeton. Once there, the marching commenced and I hit the summit at 2:24 into the day. I was surprisingly quick down Princeton's talusy SW ridge to Grouse Canyon, but just wasn't really in a groove yet...feeling drowsy and unmotivated. Once I hit Rd 292 at the bottom and started running over to Alpine, though, that all changed and I had tons of energy, running every step of the Baldwin Gulch Road on Antero to 11k' (shortly after the creek crossing) where I tried out a new, super-direct line that goes up the ridge straight to the summit. Not sure why other Nolan's folks have never mentioned this as it by far makes the most sense and has solid footing the entire way. Summited at 5:03 and didn't even pause as it was time to get off the high ridges with weather moving in quickly from the west/north. It only took me 29min to get from the summit of Antero down to Brown's Creek at 11,200' where I took a 30min break waiting out the storm that was passing through. I had a bit of a picnic here---drank four bottles of water, ate 3 gels in a row, dumped rocks out of my shoes, hunkered down in my jacket under a fir tree staying out of the rain---and when things seemed to be clearing I headed up the gulch to the Tab/Shav saddle. Another fast-moving storm cell was coming in as I made my way up, but this one turned out to be snow and a lot of it. By time I hit the saddle at 13,500' I had broken into blue skies and was surprised how close the summit of Tabeguache was, only taking 51min from the creek---I was mentally prepared for a much longer climb. Did the short bop over to Shavano and ran the trail all the way down to the Blank Cabin TH, this being my first time ever on the mountain, managing a 56min descent from the summit of Tabeguache. The trail seems like it takes a direct-enough line from the summit of Shavano to the TH. Finished with the legs still feeling really good, plenty of run left in them. 10 gels. After this week, I'm feeling really ready for Nolan's and am targeting an attempt for the 24th or 25th, depending on weather, starting at 2am from the Leadville Fish Hatchery. Right now, it looks like it will be the 24th, which coincides nicely with a full moon. It's been a blast learning everything I can about the Sawatch, but post-Nolan's I'm also definitely looking forward to spending the rest of my summer pursuing objectives in other mountain ranges. The Sangres, Elks, Tetons, San Juans, and Indian Peaks in particular. 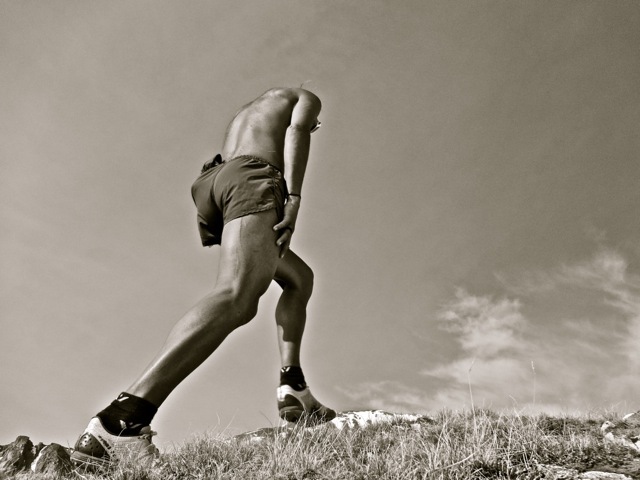 I'm feeling about as fit as I ever have right now, so am mostly just curious to see if I have the discipline and stubbornness and luck to fulfill my potential on the Sawatch 14ers next week. 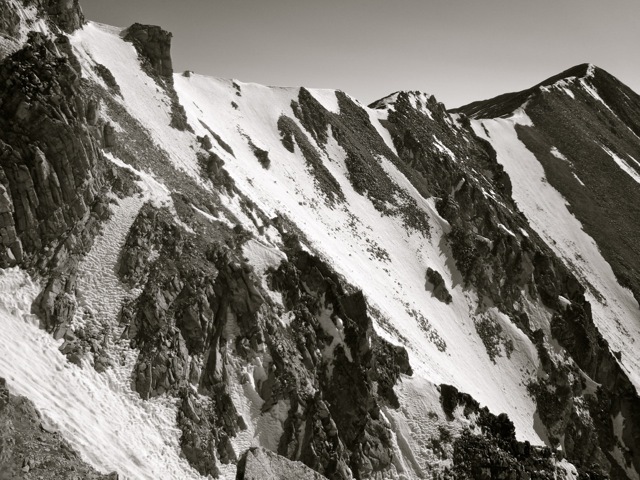 Marmot's-eye view of the march to the summit of yet another Sawatch 14er. What Nolan's mostly consists of--scrambling up talus slopes. Summit of Yale w/ Columbia and Harvard behind. Looking back across to a duo on the entry crux to Broadway on Friday morning. From the Missouri Gulch TH, out and back to Oxford, via Belford. Felt like I was still carrying some heaviness in the legs from Saturday's big run, so just cruised up and down the hills. Feeling weak above 13k' again on Belford, so I almost didn't make the run over to Oxford, but was really glad I did as I felt surprisingly strong on the pair of 700' climbs before the descent off Belford back down to the trailhead. Up and down Grouse Canyon. More Nolan's 14 scouting, this will be the descent I take off Princeton in the middle of the night, which is kinda too bad because it's a simply awesome line. Parked just off of FS Rd 292 and marched up the canyon, surprised to find an obvious use trail all the way to treeline. Gained Princeton's southwest ridge right around 13k' (right where it changes from a fairly mellow, grassy shoulder to a proper technical ridge) and enjoyed another 30min of jogging/scrambling to the summit of Princeton. Discovered that there is no skipping unranked Pt 13971 on the east side--it's a fairly dramatic drop-off there--ah well, it's only an extra 100' or so of elevation gain. After reaching the summit in 1:35, the descent was one of the more fun lines I've experienced in the Sawatch, starting with the 24min of rock-hopping back along the ridge and then plummeting back down through Grouse Canyon; the footing just feels really good from the ridge all the way back down to the road. I think I dropped the 1500' from the ridge to treeline in only 6min, sans snow. Hopefully Joe's Ferei light will make this section feel like daylight during the attempt. I was also very pleased to see that I felt fully recovered from Saturday's long run. Lots of energy, even above 13k', way more than the last couple days. Up and down from Baldwin Gulch. Ran the road up to the gulley at 12,000' or so, which, with its current snowpack, made for an extremely expedient path up through all the road switchbacks on that shoulder. Not sure how well this gulley will go once the snow melts out, though. After ~1k' of vert I left the snow and headed straight up the talus, shooting for the saddle/ridge just south of Antero's summit. Didn't pick a great line (should've been further left) so I had to cross some unpleasant ball-bearing-scree-on-hardpack slopes before taking the ridge to the summit (1:36). It still seems to me that a better line up this mountain would be to gain the rib at ~10,900' (just after crossing Baldwin Creek) that goes directly to Antero's summit. Will have to check this out, but it might just be a bunch of loose scree, which would make it terrible. On the summit, I was very disappointed that I'd decided not to bring the camera today as there was an epic inversion layer of clouds off to the east. 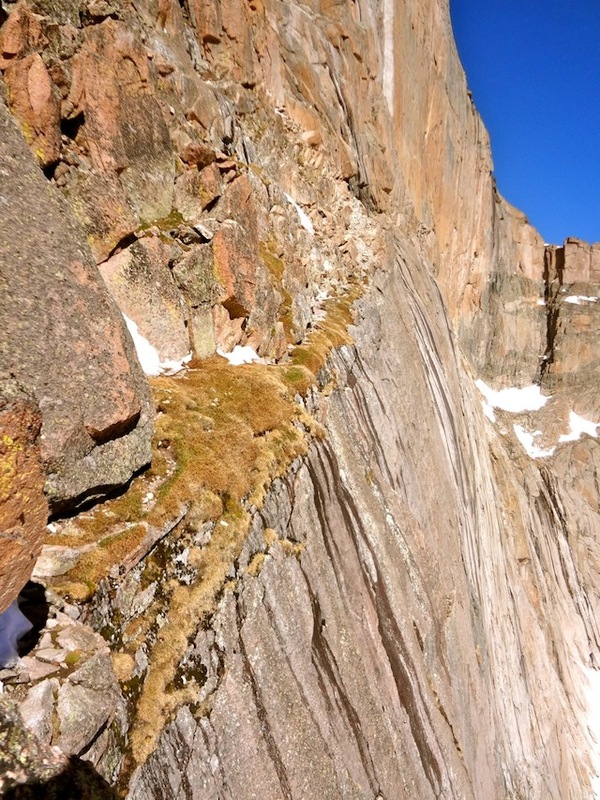 Descended via the road so that I could get a gander at the traverse over into the Browns Creek Basin (which separates Antero and Tab/Shav)...looks to be a suitable, slightly grassy rib to ascend between the Tab/Shav saddle and the summit of Tabeguache. We shall see. Once I got to the snow-gulley at 13k' I just flew back down that to the road. Parked maybe a half mile below Kite Lake at 11,500' or so, still a couple of snow drifts remaining that would take 4wd to bust through. Jogged a few minutes up to the usual parking lot and started my watch at the trailhead kiosk, thinking I'd give the circuit a solid effort despite this morning's outing and the fact that 4pm snow conditions were predictably horrible, i.e. lots of plunging in and tons of mud and running water. Took me a minute for my legs to get going (and by a minute, I mean, like, 30min), but once I got on the solid talus I was climbing pretty well and tagged the summit of Democrat at exactly 38min flat. This can definitely go a few minutes faster sans snow. The snow descent back to the saddle (43:40) was non-ideal, lots of knee-deep plunging, and then a ridiculously strong wind threw me around on the grunt up to Bross (1:01:05); I almost gave up trying to go hard right then because of the wind and because snow was preventing me from taking the best lines on the ridge. Ran hard over to Lincoln (1:07:05), though, which is really hard to do above 14k', and then tried to keep up the intensity over to Bross, too, but snow stymied a lot of my effort, and I was beginning to fade energy-wise, too. Tagged the summit of Bross at 1:21:55 and then threw myself down the 2k' of vert back to the trailhead, dropping the first 1000' on nice scree in only 5min and then taking another 7+ to descend the last 1k' and posthole/plunge back across the stream just before the trailhead for a total time of 1:34:43. I guess it's at least a standard for other people to chase now if so inclined, but in dry conditions (or firmer snow) I think I could definitely take it under 1h30. Especially with fresher legs. Parked at the 1.4mi/private property sign, like usual. Took the Dead Dog couloir up Torreys and felt like I was kinda pushing my luck with snow conditions, leaving the truck at ~6:15am, getting to the base a little after 7am and summiting at ~7:45am (1:16 from the trailhead). About a third of the way up a single fist-sized rock came whizzing by really close, but that was it for the whole route. That made me really glad to be wearing a helmet, though. Super warm on the climb, that chute is like a reflective solar oven with the rising sun. Legs were definitely slow and tired from yesterday's efforts. Left my Kahtoola crampons on for the quick drop and climb over to Grays (snow the whole way), but after that things had softened up just enough to make running shoes sufficient for the descent back to the car. Total time trailhead-to-trailhead was 1:58. Way more snow on these peaks than in the Sawatch. Typical afternoon outing: biked to Chat, scrambled the rock on the way to the summit of Green, descended the front. Notably, I had one of my faster efforts to the base of the rock (low-11min) without really trying---I could really feel the extra oxygen compared to what I've been breathing for most of the past two weeks. It also felt (comparatively) humid; I was sweating buckets. This wasn't really four hours of running. More like 2h30. Planned on summiting Longs via the 5.6 Keyhole Ridge and descending the Cables, but Joe and I were chased off the ridge about half-way up. Ran at a casual pace to the Keyhole with a 7.7x37m rope in my pack and some stoppers and four cams in Joe's pack. Got there in less than 90min where we opted just kick steps in our running shoes across the snowfield leading to the 3rd Class ramp that goes to the False Keyhole. This ended up being a bit spicier than I anticipated as the snow as very soft and only a small margin of moss/loose rock was bare right on the extremely exposed edge of the ledge. We scrambled this carefully before roping up for a very easy pitch of climbing up to the escape saddle just before the first tower. Conditions were still brilliant, so we were quite jolly pitching out the easy rock that leads up the tower. There was still some snow on a lot of things, though, so we were happy to be roped up for the on-sight. Less than a pitch from the top of the tower, though, it was clear the weather was going to get nasty very quickly and we heard several rolls of thunder, which was more than a little unnerving. I refuse to mess with lightning, and we were in an extremely exposed position on a knife ridge near 13,700'. So, I quickly lowered Joe then rappelled/downclimbed off a pair of stoppers before scrambling back over to the escape saddle by which time the wind was raging and it was snowing hard. Another bank of clouds was moving in fast from the west so we scrambled west back down to the Keyhole and called it a day, running back down to the trailhead through drizzle. Up and down the North Face. After yesterday's failure to summit, and anticipating tomorrow's long outing, I opted to just cruise up and down the shortest line on the peak. There were crazy winds in the parking lot, but above treeline it turned out to be just a standard breezy day. Didn't even put crampons on until I was half-way up the Cables dihedral, and then on the way down I didn't even get out my rap cord or harness. Still a ton of snow above the Cables, but way less than last week. Great run, can't wait to start hitting this mountain in just shoes and shorts again; it's getting there. Pretty epic run. Started with Joe from Rockdale, ran the 4wd road up to Clohesy Lake and started the Nolan's 14 line. Misouri, Belford, and Oxford are all cruises, but then the drop into the Pine Creek drainage marks the beginning of basically all off-trail running for the rest of the day. Nailed the descent to Pine Creek and the march up Harvard and then was psyched to complete the traverse to Columbia via Rabbit Ridge instead of doing the usual drop to 12,800' on the east side. Staying on the ridge necessitates a fair bit of 4th Class and low-5th Class scrambling with a short, maybe 20ft crux downclimb that allegedly goes at 5.7. 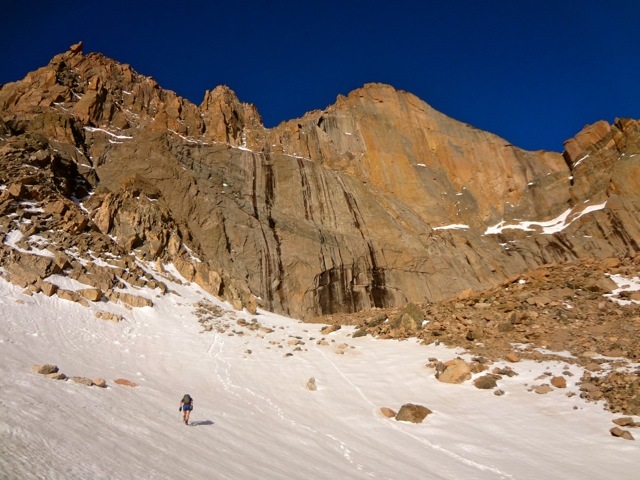 It was a vertical crack, but it felt easier than that to me, considering I was on-sight, solo, in running shoes, at ~13k' after almost 5hr of running. The descent south off of Columbia marked the beginning of new territory for me and it went pretty well as I found a pretty good line in the trees, aiming for the base of a giant avalanche chute on the south side of N. Cottonwood Creek that would take me up to Yale's northeast ridge. This felt like bumbling wreckage through heinous bushwhacking on extremely steep terrain and even a few cliffy outcroppings, but eventually--after much swearing and cursing--I found myself postholing near treeline and then it was just the endless ridge leading to Yale's summit. Once on the summit I didn't think I could stomach anymore bushwhacking, so I started out planning on just taking the east ridge down to the Colorado Trail, but a couple of perfectly glissade-able snow slopes lured me into the Avalanche Gulch basin between Yale and Mascot Peak and even though there was some more bushwhacking around 10,800' or so through many many downed trees I kinda hit the line perfectly and was down at the Avalanche Gulch trailhead only 49min after leaving Yale's summit and with legs that still felt like they had a ton of run left in them. 10 gels. Joe had a few navigational issues (as is wont to happen when traveling all day off-trail) and came in four hours later, thankfully before a headlamp was needed. Obviously, a great week up high. Yesterday's run has me seriously reconsidering my Nolan's plan. Given how hideous the route-finding is in the North Cottonwood Creek drainage between Columbia and Yale, I think I want to do my best to hit this in the daylight, so will probably end up starting from the Fish Hatchery at 2 or 3am instead of my initially-planned 5am/first light start. A start in the dark will also help ensure that I take it easy for the first couple peaks. Other than that, Sunday's run was great. Depending on what the sky is doing at the time, I'm pretty sure I'll take the more technical Rabbit Ridge between Harvard and Columbia, purely for aesthetic reasons as I was only a minute or two slower on it Sunday than when I dropped to the east when linking them up last summer. Also, energy-wise I felt very solid yesterday and finished the run remarkably fresh, which is, of course, a boost to the confidence. The final ridge leading to Princeton's summit from the SW. Taken just below Pt 13971. 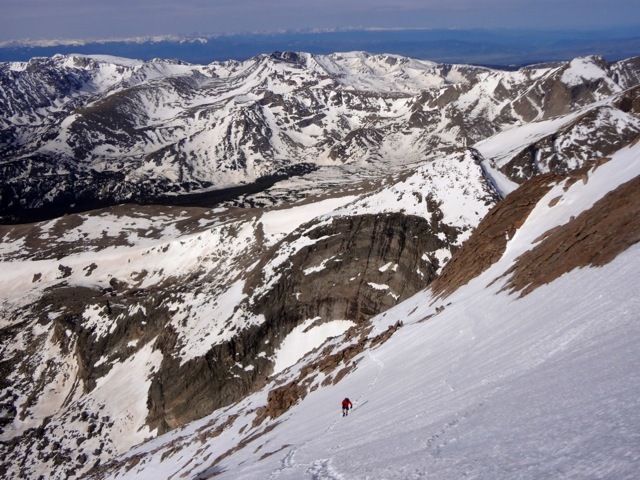 Dropping down Princeton's SW ridge, the nearly vertical mile climb to Antero looms straight ahead. 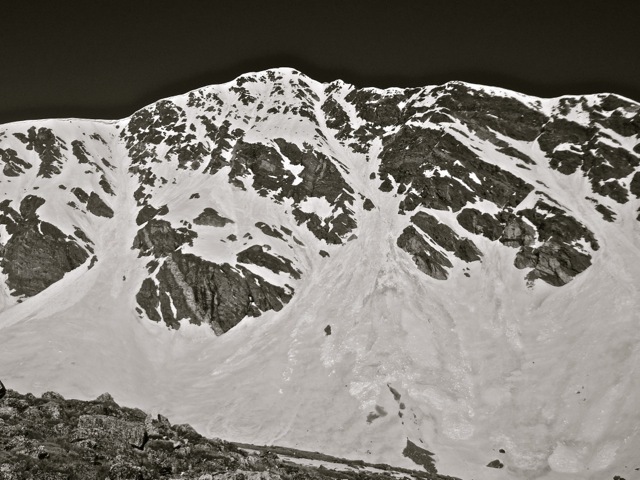 Dead Dog Couloir (center-right) offers 1500' of 45-50 degree snow climbing to the summit of Torreys (14,267'). Nearly to the top of Dead Dog. 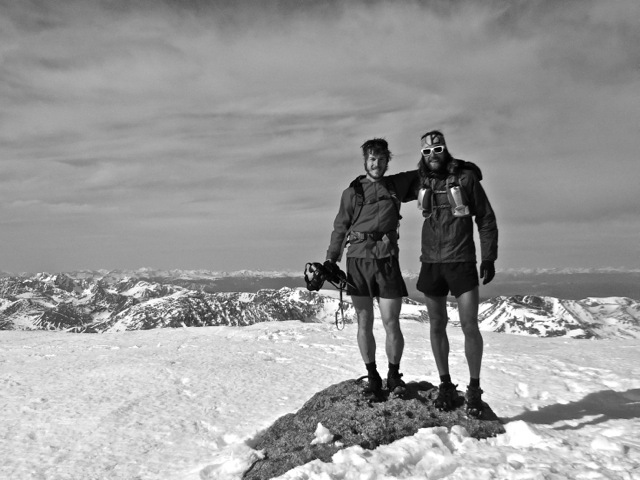 No summit of Torreys is complete without standing atop Grays (14,270') as well. 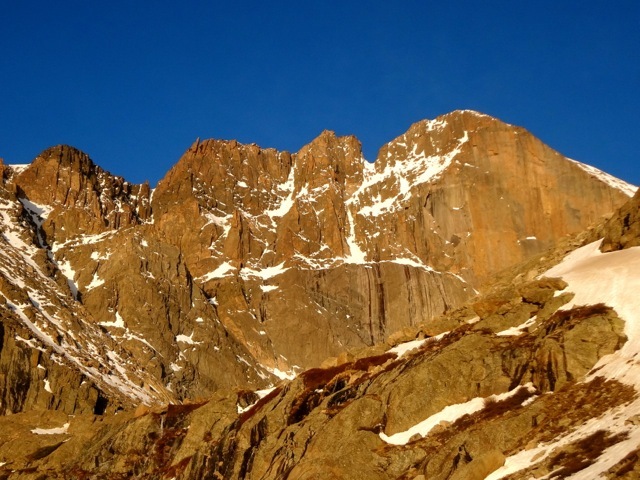 Longs Peak summit #13 for the year on Saturday. Up and down the NE ridge. Did the roundtrip from TH to summit and back in a few minutes under 2hr, but got in some extra time/vert on the corniced southwest ridge as Joel was waiting for me up there so he could do some filming. Brilliant morning on the hill. PM: 1:06, 3000' ~ First Flatiron+Green Mt. Ran from Chat with Joel, who joined me to the top of the First. With Joel initially nipping at my heels I tagged a snappy 12:30 scramble on the slab before downclimbing and heading to the top of the mountain alone. So awesome to see the transformation of Boulder from spring to summer in the past week I've been away. Up via Lambs Slide and Clarks Arrow, down the North Face. Got a 5am start from the trailhead, giving Joel a 45min head-start. There wasn't much snow until Chasm Lake, but all of the snow was in excellent condition, consolidated and frozen, accepting Khatoola crampons quite well. 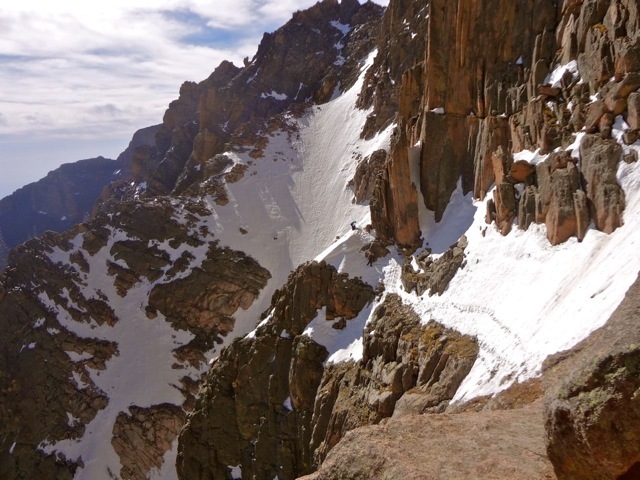 Lambs Slide and Keplinger's Couloir/The Homestretch were classic snow marches in perfect conditions, nary a breath of breeze all day. The descent of the North Face down to the top of the Cables was by far the spiciest terrain of the day. Descending such steep snow facing in was tedious and required focus. Rapped the top half of the Cables and downclimbed the bottom half before running down the apron of snow below there, removing crampons, and enjoying a smooth run back down to the cars. Back below Mt. Lady Washington, the now slightly softer snow conditions were ideal for descending fast. Really good to be back on the mountain after not being up there since early April. #12 of the year. Biked to Chat, 12:25 scramble, then to the top of the mountain and descent of the front. Had a bunch of energy in my legs, which was nice. Wed-AM: 2:01, 3000' ~ Green Mt. Ugh, one of those rough days. The string of early mornings and big days of vert caught up to me, plus motivation was severely affected by the cold rain falling. Eventually stumbled out the door, though, and jogged up and down the mountain at the easiest effort possible. Up Gregory-Greenman, down Ranger-Red Lion-Creek Path. The rain eventually stopped and I was treated with a lot of magical clouds sweeping around the summits. Thu-AM: 2:17, 5700' ~ Flatiron Quinfecta+Green Mt. Got a late start because Joel and I drove up toward Ned, headed for the high country before realizing that, yes indeed, the weather forecast wasn't lying and the Divide held truly apocalypse conditions (snowing, hurricane winds). So we headed to Chat for some flatties, instead. After some stop-and-go, leap-frogging each other on the First, we ran into Dakota on the summit and had a long, casual conversation in the sun. From there, though, I continued on alone and clocked some of my best splits ever in linking some Flatirons together; legs felt really strong. Yesterday's easy day did a lot of good. Really good pep in the legs tonight, and I made it to the summit of Green from Chat in 42min, which has to be a PR or close to it for ascending via the First Flatiron. Good downhill, too. Got up really early for some filming in good light on the First with Joel. Really windy on the arete and downclimb, though. Ran back down to the hut after we were finished. Had planned a peak in the high country in the evening, but the hurricane winds persisted up there so I decided to just save the energy for tomorrow's outing. First three peaks of Nolan's 14. I started from Halfmoon for logistical reasons and to hopefully save some postholing below treeline (if I'd started from Fish Hatchery), but because of the extensive snowfield on Massive's upper face I ended up reaching the summit in a similar time that it usually takes me to summit from Fish Hatchery (1:46). Immediately turned and started descending Massive's SW slopes, which started dodgy but then turned into an incredible 2500' drop completely on perfect, steep snow that took something like 12min. It was awesome. Too early in the morning for glissading, but running was probably even faster, if harder on the ol' quads. Somewhere in this plummet, however, I lost my 8oz Hydrapak flask, which had been my only water-carrying device for the day. Bummer. I spent a lot of time drinking at streams before the monster climb up Elbert's west ridge, but apparently it wasn't enough as I was really fading toward the top and had even mostly resolved to bail at the summit (3:55) and just descend back to Halfmoon. 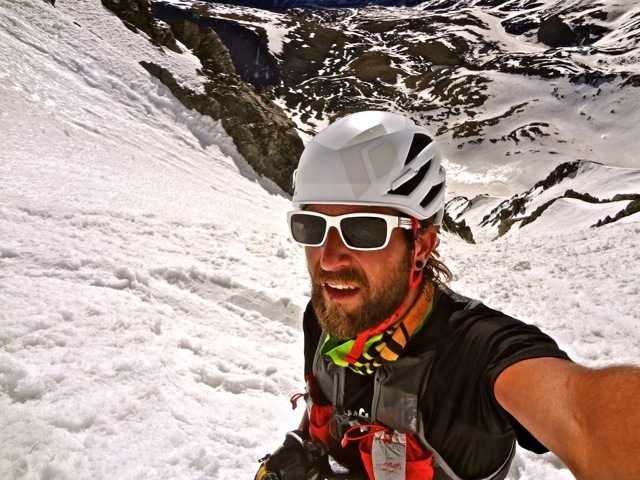 Luckily, Joel was up there for a couple minutes of film and was in a particularly cheery mood after PRing up the NE ridge; his mood was infectious, and, even more importantly, he gave me a bottle to complete the rest of the run with. The descent off Elbert past the Golden Fleece mine and down Echo Canyon was particularly fast with snow every step of the way until the mine, and by time I started up La Plata (trailhead at 5:04) my energy seemed to be at an all-day high. Things were really good on the LP climb until I got above 12k' or so...where the altitude proceeded to smack me hard. The final 1500' to the summit was a total, staggering horror show on an endless, baking hot reflective snowfield. 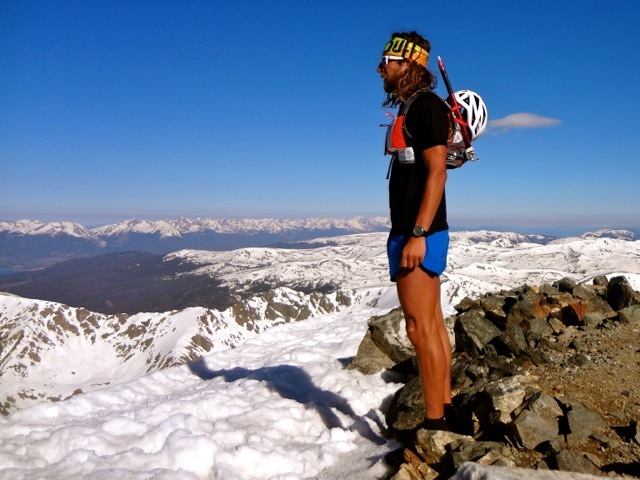 I had plenty of gels and water, so that, along with the splitting headache I had seemed to indicate that it was just all the time above treeline finally catching up with me. It's still early in the acclimation process for me. 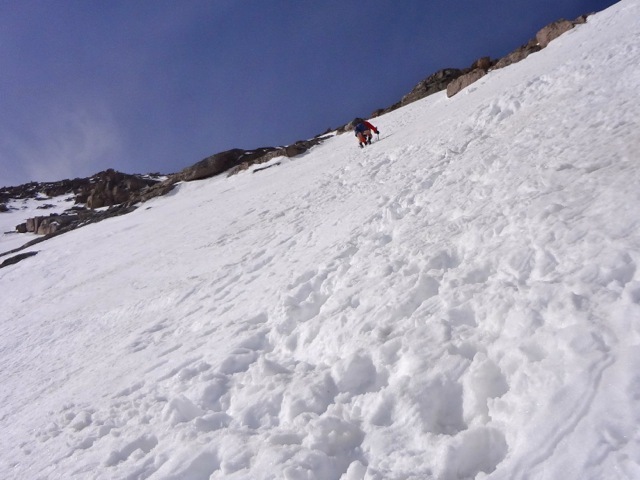 Fortunately, there was another perfect snow descent off of La Plata, too---this with some of the best glissading of my life---and despite what felt like days of thrashing around in the hip-deep snow/willows/water just above treeline I was down in Winfield less than an hour after leaving LP's summit. Awesome day, but my fitness---both mental and physical, specifically my altitude acclimation---still has a ways to come before I attempt Nolan's later in the month. Up and down the NE ridge. Jogged about a mile on the road to wake up the legs before starting up the hill. Gorgeous day, perfect conditions, the snow is shrinking quick. Legs were tired, but not terrible. Easy shake-out jog in the evening. This felt like the first week of proper summer running. A few 14ers, some flatties, all of it really enjoyable. As expected, the first real foray onto a chunk of the Nolan's line was sobering in its difficulty. What a monster route. I spent a lot of Saturday relearning techniques of not looking too far into the future, remaining in the moment, staying concerned only with the task at hand. Something like Nolan's is impossible to complete if you get too far ahead of yourself mentally. 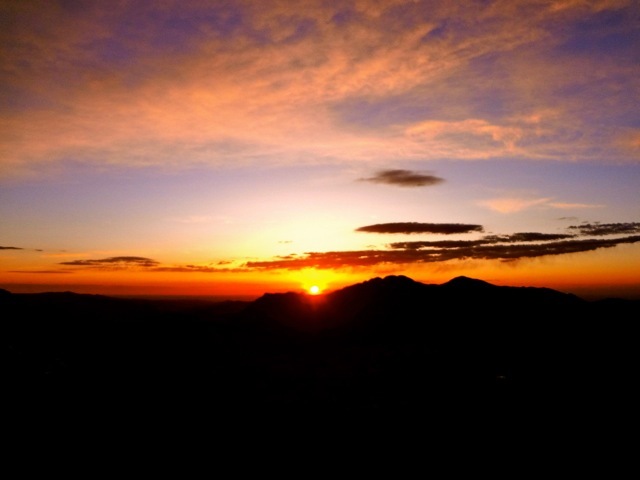 Sunrise over Twin Sisters Tuesday morning. Snow beta shot on the condition of the East Face. Flying Dutchman and the Notch both look good still. Joel marching up toward the base of Lambs Slide. Joel on upper Lambs Slide, well above Broadway. 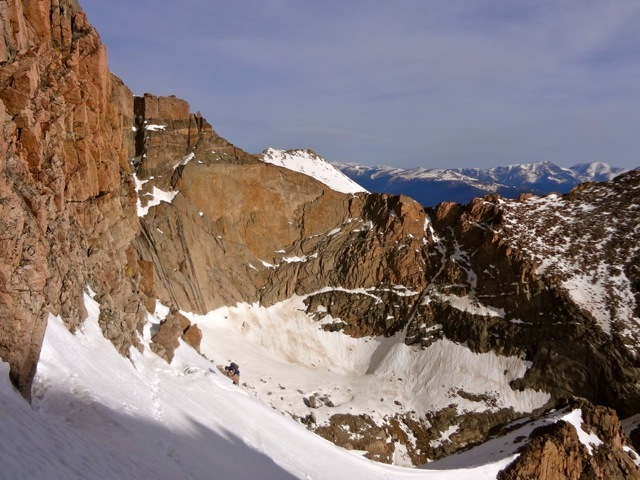 Joel crossing the saddle between the Lambs Slide and Flying Dutchman couloirs. Joel slogging up the Homestretch. Three 14ers in four days for a West Virginia boy. Obligatory summit shot with the 'tinger. The North Face descent above the Cables was uncommonly steep, but very good snow. Summit ridge of Mt. Elbert on Sunday morning.